Every year, the information below is put into the Messenger. This information is so important that I believe it bears repeating. Many of you will be heading off to college or university for the first time and perhaps even moving away from home. 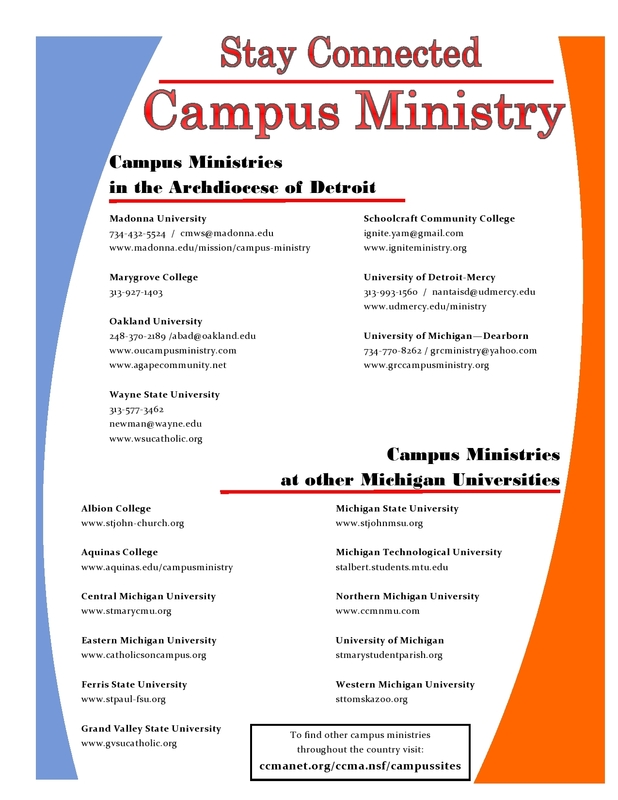 An incredible resource you will find at most colleges and universities is Campus Ministry. These are great organizations which provide opportunities for prayer, retreats, liturgies, discussions, counseling, and plain old fun! From experience, I can tell you that the liturgies and prayer services on campus are nothing like what you are familiar with. They are neither better nor worse—just different. You are surrounded by people your age, with common interests, and an enthusiasm like you have never seen! Liturgy is an awesome experience and you have the opportunity to totally immerse yourself in a plethora of ministries. As you move in to your dorm or make the commute from home, I encourage you to check out Campus Ministry at your college. Let us know what your college spiritual life is like and what you would like to see us try to incorporate at St. Michael.